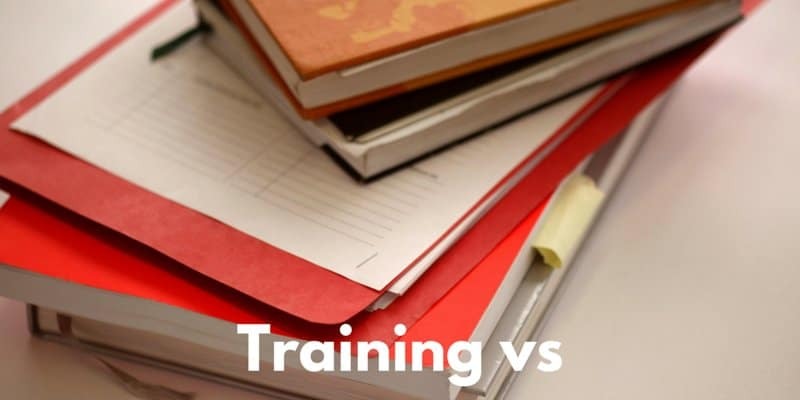 There are a lot of assumptions made in the training world, from the name of the Learning & Development department to what the people are called who take the training (learners if you’re not familiar). These assumptions have an effect on how we treat people whether it’s obvious or not. To me the difference needs to be clarified so the job and purpose can be clarified. Training – This is an experience that is designed or delivered. There is an experience involved which might be where the term learning experience comes from, but the experience of learning cannot be attached to the training itself, it’s merely a hope. the action of teaching a person or animal a particular skill or type of behavior. Save that definition for the next section. Learning – A lot of confusion enters here when training is more often than not interchanged with learning, as if they’re the same thing. The confusion is exacerbated when learning is skewed even more to refer to somebody taking training. You know, learner. the acquisition of knowledge or skills through experience, study, or by being taught. This leads to my next observation; there is no learning until there is learning. The confusion and misnomer is when somebody taking training is called a learner. There is a presumption made when somebody is called a learner, to say you’ve successfully taught them something because you are designing for them. There is no learner until somebody has learned something. When a training solution is being developed, there is not yet a learner and perhaps there will not ever be depending on how successful it is. When asked who your audience is, or when talking about your audience, the term learner (They’re not learners, they’re people) should never cross your lips. There is no learner from a trainer or designers point of view, there are only users. Only the person doing the learning can call themselves a learner, the label is up to them. I cannot count the number of eLearning courses or instructor led classes I’ve been in where I’ve learned nothing, I just take them because I have to. I also cannot count the number of webinars I’ve taken where I’ve anticipated learning something but was unfortunately let down. I do not think it’s fair for the instructor or designer of those courses to call me a learner. They’re telling me they were already successful even before anybody participated, even if they did a horrible job. A bit of arrogance there? I’d say so. Part of the problem is in the name that’s so common for people to refer to the training department. One of the most common terms is Learning & Development which immediately sets a state of mind that the audience is a “learner”. Kind of wondering if the problem of referring to "learners" is rooted a bit deeper in the name L+D. Maybe should only be T+D. I think a better way to refer to the department would be to remove the learning altogether and go with Training & Development. You’ll already find Training & Development used, but it’s much less common. There’s also the added benefit of making it more obvious that the department may own training, but it doesn’t own learning. Other benefits from a name change are that learning may be less seen as being owned by one department. The goal of many (should be all) organization is to have a learning culture where employees seek learning and improving themselves on their own. A learning culture comes from a wider organization though, never from a single department. No one department can own learning or helping employees improve their careers through learning. With the name change puts the task of the department clearly in view, to manage and create training and aid in developing staff. Learning as a whole belongs to the organization and each employee in it. In another Tweet from my musings, I think about how a training culture belongs to L+D but a learning culture is not rooted in any department. We want an org wide learning culture but a learning culture is not rooted in one dept. A training culture is and that's what L+D does. Making the shift in thinking from learning to training is a difficult transition, but a necessary one for learning to claim its rightful place in the organization. With the term learning being used in place of training, the entire organization is being done a disservice by not allowing for an easier interpretation of a learning culture. Training culture will often be seen in place of a learning culture because it’s easier to classify things this way. Executives love things boiled down in simple terms that are easy and quick to understand, and Learning & Development does that to the detriment of creating a true learning culture in the organization. Have you seen organization which believe to have a learning culture when in fact what they have is a training culture? I’m curious to do a bit more thinking and research on how best to achieve the mind shift from a training culture to a learning culture.